As you reach the outskirts of the city, busy roads give way to tranquil rice fields, the paths get smaller and the air gets fresher. Your half day with the Eco-Village Tours take you to a typical Cambodian village where you will make many stops to gain a true insight into the local village life. Your guide today will lead you through the stunning countryside to the local village where you will stop along the way to meet the people. Experience life as a local farmer when you visit pig and duck farms; learn all about the growth of rice - Cambodia's staple food; sample the local rice wine and learn how the vilage women weave rattan baskets to make additional income. Finish your tour at a local pagoda learning a little about the spiritual side of Cambodian life before returning to Siem Reap. your guide to the village. Siem Reap has withstood the test of time during past wars; remnants of these times are shown when we take you around Siem Reap to a local pagoda and the interesting War Museum. 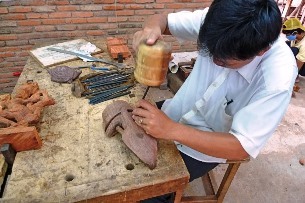 Finally, keeping traditional arts alive is shown at Les Artisans d'Angkor. Touring in and around Siem Reap is something that is often overlooked. Travelers seldom take in the charm and unique characteristics of Siem Reap itself. A combination of history, Buddhist believes and showing you the artful craftsmanship of its residents. Our morning (or afternoon) starts from your hotel lobby where your guide and driver for the next 3 hours will drive you to the Wat Thmey. This small pagoda has been thriving with life as many young monks see this as one of the most important places in Siem Reap to brush up on their English skills. 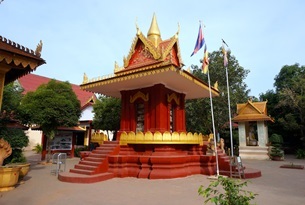 The pagoda is well-known as a reminder of the cruel acts from the Khmer Rouge – a dedicated Killing Field memorial stupa has been erected on the temple grounds as a reminder of the harshness in the past. The stupa contains bones and skulls who have succumbed under the practices by the Khmer Rouge in the 20th century. Our day continues to the War Museum; it shows visitors an insightful view of the lives of the Cambodian nation when it was engulfed in war for three decade before we end the day at the building and work done at ‘Les Artisans d'Angkor’. This institution has been set up in an effort to revive the ancient Khmer traditions of stone-carving and wood-sculpting. Many of the apprentices of his center have been part of an ever-growing art scene in Cambodia and their skills are recognized throughout the Kingdom. After this visit and a chance to browse through some of the completed art work, we bring you back to your hotel.